A public health emergency has been declared in California amid deadly wildfires. Search crews have found eight more sets of remains in the burned-out rubble of Northern California, as officials there fear more deaths in the destructive wildfires raging at both ends of the state that has already claimed a total of 74 lives, including three lost in Southern California blazes. The deadliest and most destructive of the two massive blazes is the Camp Fire in Northern California's Butte County, which has killed at least 71 people. There were more than 1,000 people still missing in the Butte County fire zones on Friday night, though authorities were working to track them down. Officials asked residents to go to the Butte County Sheriff's Department's website to check the missing persons list to make sure they are not on it. 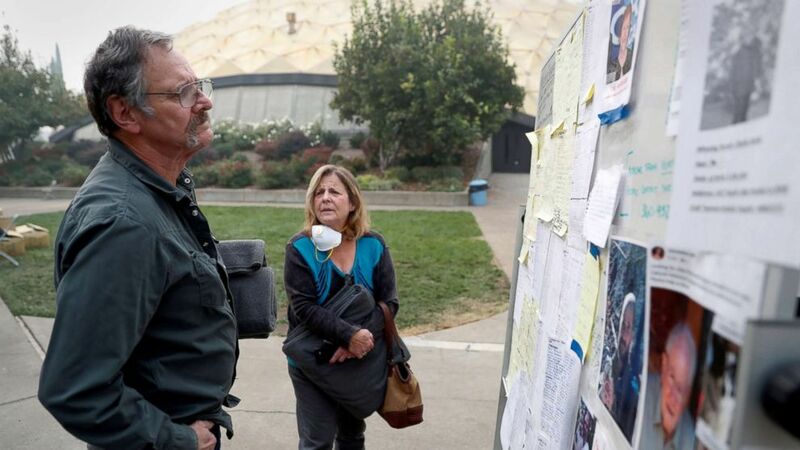 (Terray Sylvester/Reuters) Lane and Julie Walker, of Magalia, look for people they know on a list of people missing in the aftermath of the Camp Fire in Chico, Calif., Nov. 15, 2018. Thom Porter, chief of strategic planning for the California Department of Forestry and Fire Protection, said the death toll from the Camp Fire is expected to climb higher as search crews comb through more than 12,000 structures destroyed by the flames. "It is by far the most deadly single fire in California history and it's going to get worse, unfortunately," Porter said of the Camp Fire. California Gov. Jerry Brown toured the devastation caused by the Camp Fire earlier this week with Brock Long, administrator of the Federal Emergency Management Agency (FEMA), as well as U.S. Interior Secretary Ryan Zinke. The government leaders visited the firefighters still battling the inferno, which has burned an area of 142,000 acres and obliterated the city of Paradise, ravaging nearly every home in the bucolic community of 30,000 people. "This is one of the worst disasters I've ever seen in my career, hands down," Long said at a news conference Wednesday in Northern California. (Ringo H.W. 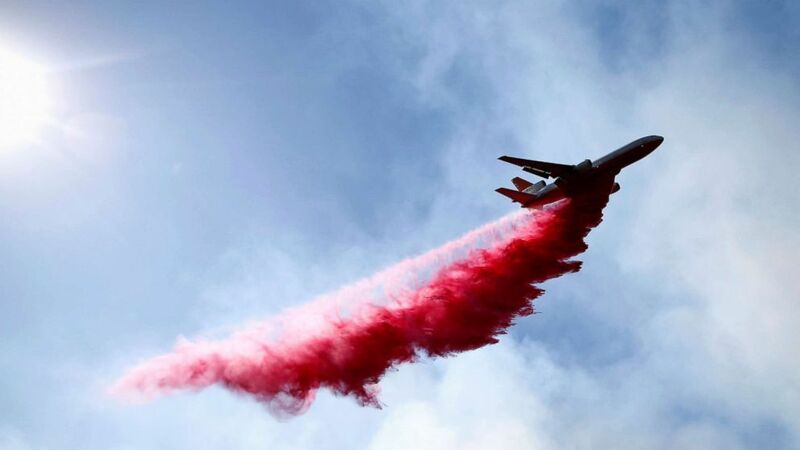 Chiu/AP) An air tanker drops water on a fire along the Ronald Reagan (118) Freeway in Simi Valley, Calif., Nov. 12, 2018. Brown said the destruction "looks like a war zone." He said he spoke earlier Wednesday to President Donald Trump, "who pledged the full resources of the federal government" to help in the recovery effort. Trump said he plans to visit the area on Saturday to meet with survivors and firefighters. U.S. Health and Human Services Secretary Alex Azar on Wednesday declared a public health emergency in California, where the wildfires forced the evacuation of at least two hospitals and eight other health facilities. "We are working closely with state health authorities and monitoring the needs of healthcare facilities to provide whatever they may need to save lives and protect health," Azar said in a statement. "This declaration will help ensure that Americans who are threatened by these dangerous wildfires and who rely on Medicare, Medicaid and the Children’s Health Insurance Program have continuous access to the care they need." A smoke advisory was issued for portions of Los Angeles County amid concerns that smoke from the fires could present a "significant health threat" for people with asthma and other lung conditions, according to the U.S. Department of Health and Human Services. The best time to venture outside will be in the early afternoon, National Weather Service meteorologist Aviva Braun told reporters Wednesday night, blaming the light winds for the continued poor air quality. On Saturday, stronger northeast winds mixing in the valley will help improve the air quality, according to Braun. Lisa Almaguer, public information officer for Butte County Public Health, recommended residents stay indoors as much as possible and to wear properly fitting masks when going outside. In addition, an outbreak of norovirus has occurred at one of the shelters, Almaguer said, describing its presence as "not uncommon," especially at this time of year and "with hundreds of people living in close quarters." People who are ill at the shelter have been taken to a separate location, are using separate restroom facilities and are being cared for by public health experts, according to Almaguer. (Noah Berger/AP) Homes leveled by the Camp Fire line a development on Edgewood Lane in Paradise, Calif., Nov. 12, 2018. Thousands of exhausted firefighters battling the Camp Fire in Northern California and the Woolsey Fire in Southern California appeared to be getting a handle on the two massive blazes this week. Chief Ken Pimlott, director of the California Department of Forestry and Fire Protection, said weather conditions at both fires have improved and the strong winds firefighters were seeing over the past three days have started to dissipate. But Pimlott said "critical fire conditions" still existed with an abundance of dry vegetation in both fire zones that could flare-up with the slightest spark. 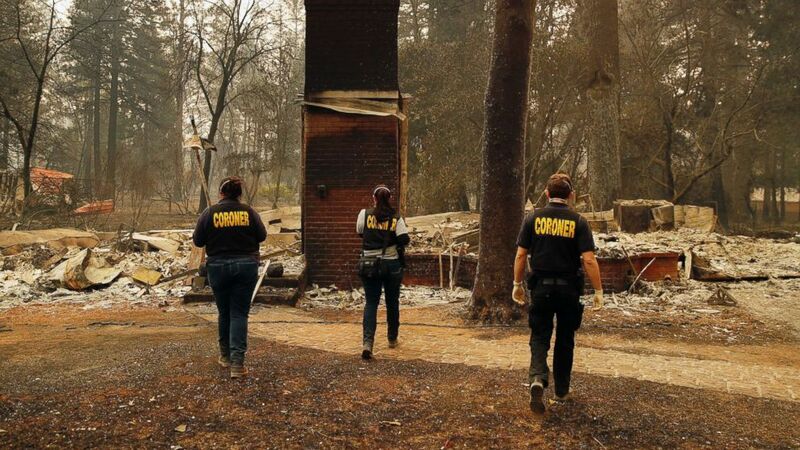 (John Locher/AP) Members of the Sacramento County Coroner's office look for human remains in the rubble of a house burned at the Camp Fire, Nov. 12, 2018, in Paradise, Calif.
"We're not keeping our eye off this ball at all," Pimlott said Wednesday, adding that 9,000 firefighters were working on the front lines of both blazes. Firefighters, with the help of out-of-state fire crews, were showing progress in their twin battles to subdue the widely destructive blazes that have blackened a combined acreage larger than the size of New York City. The Camp Fire showed "continued activity" on its northeast side, along the Feather River drainage basin, as it pushed toward the community of Big Bar, the California Department of Forestry and Fire Protection announced Tuesday night. The lower part of the area continued to be a challenge because of the "extremely steep, extremely rocky" terrain, fire officials said. Dry conditions will continue this week but precipitation is expected next week, Braun said. The Camp Fire ignited Nov. 8 in Northern California's Butte County and has since burned an area of 142,000 acres. The flames were 45 percent contained on Friday morning. The death toll from the monstrous blaze now stands at 71, making it the deadliest single wildfire in California's recorded history. Officials have tentative confirmation of the identities of at least 53 of those found dead, but are awaiting DNA confirmation, Butte County Sheriff Kory Honea told reporters Thursday night. The sheriff warned that the remains of some of the missing may never be recovered due to the severity of the fire. 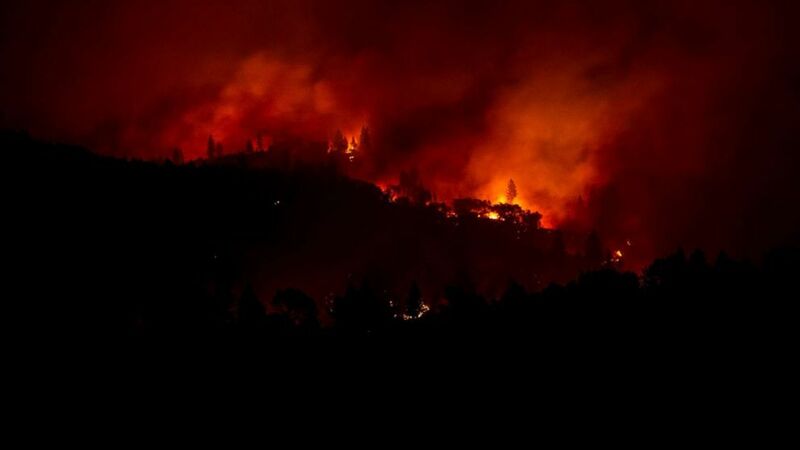 Two prison inmate firefighters were among three injured battling the Camp Fire, fire officials told ABC News. (Stephen Lam/Reuters) The Camp Fire burns along a ridge near Big Bend, Calif., Nov. 10, 2018. 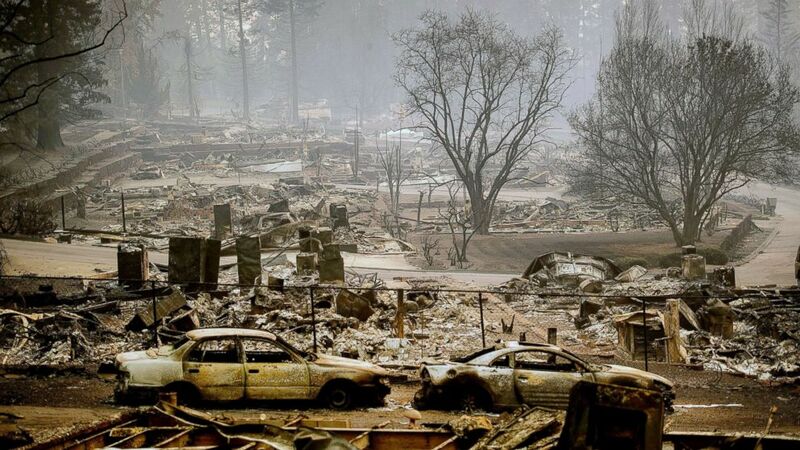 Many of the deaths from the Camp Fire have taken place in Paradise, which was virtually destroyed by the flames. "The entire community of Paradise is a toxic wasteland right now," Paradise City Council Member Melissa Schuster, who lost her home in the calamity, told ABC News' "Start Here" podcast. "In addition to that, and this is the hardest part for me to even talk about, is the number of fatalities is [among] things that we don't know at this moment and that's something that has to be determined before people can move back in." 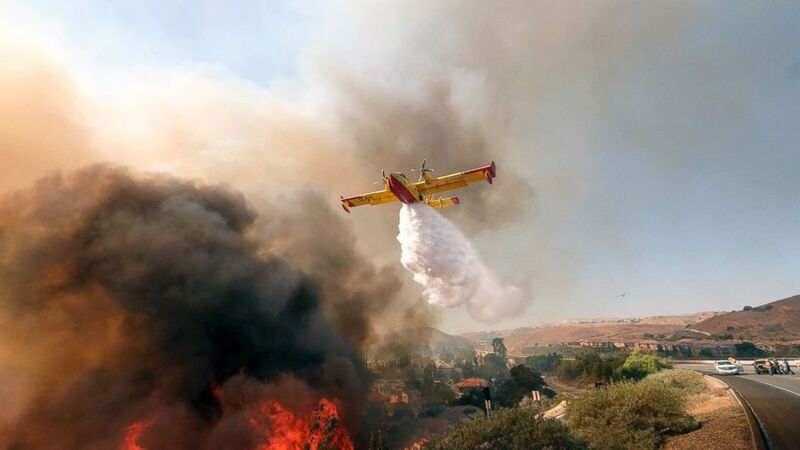 (Eric Thayer/Reuters) An aircraft drops flame retardant as firefighters battle the Woolsey Fire as it continues to burn in Malibu, Calif., Nov. 11, 2018. Schuster said teams from the Butte County coroner's office are combing through thousands of destroyed homes and burned cars in Paradise. "We will rebuild our homes, we will rebuild our town stronger, better, safer and more beautiful than ever," she told ABC News' "Start Here" podcast. The Woolsey Fire, which also started on Nov. 8, rapidly spread from Southern California's Ventura County to Los Angeles County, jumping the 101 Freeway before sweeping through the celebrity enclaves of Malibu and Calabasas. Authorities had warned the flames could potentially spread all the way to the Pacific Ocean. It has burned 98,362 acres and was 78 percent contained on Friday night, as firefighters successfully stretched containment lines. But the blaze has already damaged or destroyed over 900 structures, including many homes and a legendary Hollywood film set. The fire burned down a portion of Paramount Ranch in Agoura Hills known as “Western Town,” where hundreds of movies and television shows, including HBO’s “Westworld,” have been filmed, dating back to the 1920s. The blaze has been blamed for the deaths of at least three people, and three firefighters sustained injuries while battling the flames, according to the California Department of Forestry and Fire Protection.